Life can get a little crazy for all of us, from time to time. It’s not unusual for sleep, a healthy diet and exercise to fall to the wayside. Everything’s fine for a little while. Until, it’s not. Eventually, we burn out. Then, a cold, flu, or some other virus comes along and knocks us to our knees—or more often, to the nearest couch or bed. Sound familiar? It’s been scientifically proven that stress affects our well-being, and humans aren’t the only ones to feel its effects. 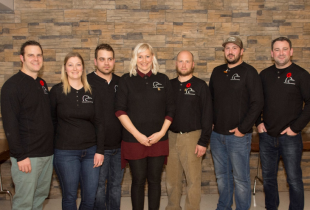 “There are these multiple, continuous factors that are going to impact your health and the same goes for birds,” says Jane Harms, a veterinarian with Environment Yukon. Harms is the lead author of a research paper that explores the cross-seasonal effects of stressful moulting periods on Arctic migratory birds. This innovative work earned her the 2015 DUC Institute for Wetland and Waterfowl Research (IWWR) Student Publication Award. By analyzing tail feathers collected from common eiders at nesting grounds on East Bay Island, Nunavut, over a five-year period (2007-2011), Harms and her colleagues learned that birds who experience stressors during moult arrived to breeding grounds later, and were less successful at producing a clutch of eggs. A field worker/biologist captures common eiders on East Bay Island. 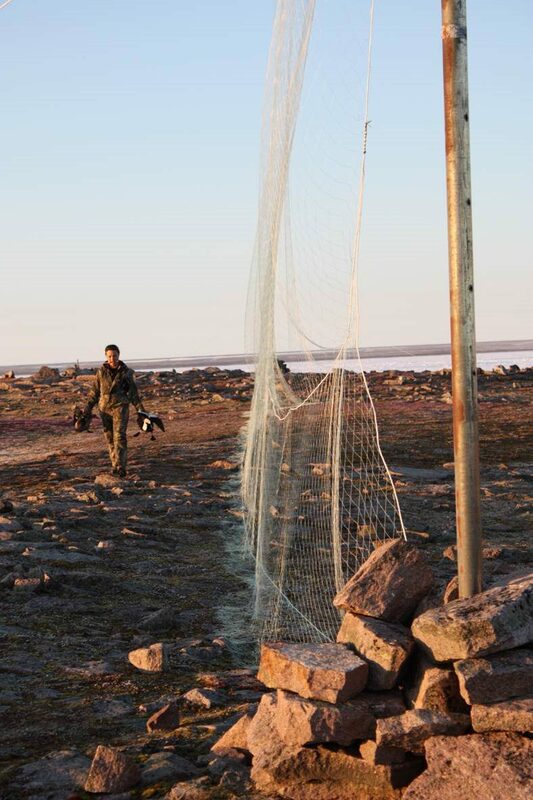 Eiders are caught by large mist nets as they fly over the island, are quickly removed by field workers and are taken to an area for sample collection, measurements and banding. “The interesting thing about carryover effects… is that we know from ourselves that our particular health isn’t just what’s happening to you at this moment. It’s influenced by everything from who your parents are to what you eat and how you eat it,” says Harms. Or, in the case of Arctic waterfowl: how your moult went. Moulting is a process that all waterfowl species go through at least once a year. It sees them losing their flight feathers, and growing new ones in their place. And it’s one of the most energy-taxing activities waterfowl experience, second only to producing a clutch of eggs. Birds must consume a great deal of protein-rich food (like invertebrates) to meet the nutritional demands of a moult, as well as to give them the energy they need to avoid predators, and other threats. A stressful moult (caused by outside factors, like predators and poor habitat) can result in a bird growing shorter flight feathers, which makes travel more difficult, and tiring. Feather analysis research and new technology has helped researchers like Harms better understand the effects difficult moults have on waterfowl. 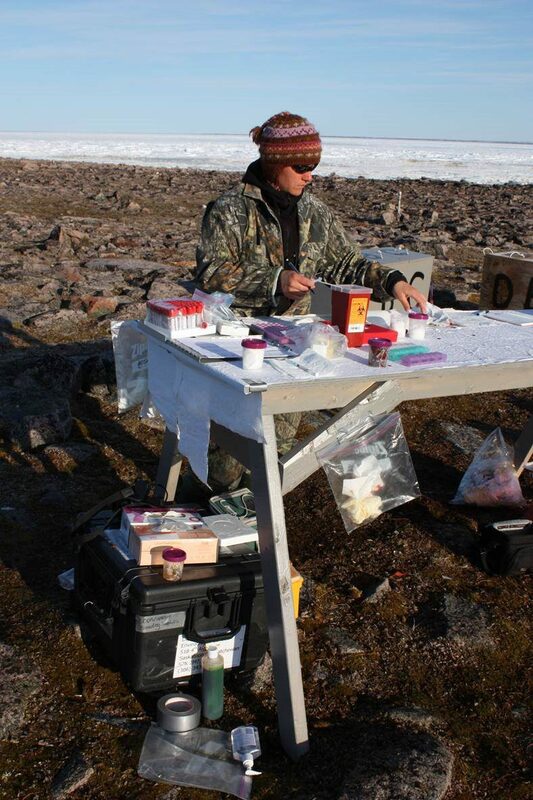 Dr. Jane Harms working at the field site on East Bay Island, collecting disease surveillance samples from common eiders. Unlike other body tissue, feathers develop in a relatively short span of time and once they’ve finished growing, they become metabolically inert. By collecting feathers from waterfowl on Arctic breeding grounds and later analyzing them, Harms discovered birds with elevated corticosterone levels (a hormone the body produces to manage stress) were the same birds who were less successful during the nesting period. But that’s not all. Common eiders who experienced a stressful moult were also 30 per cent less likely to survive an avian cholera outbreak. First identified in Canada in the 1940s, avian cholera is a bacterial disease that’s resulted in substantial mortality among common eiders on East Bay Island, since its detection there in 2005. “Avian cholera on East Bay Island has caused annual eider mortality, and adult eider survival rates and reproductive success [to plummet] since the first confirmed outbreak,” writes Harms, in a 2012 article published in Arctic. The deaths have had a negative impact on the northern ecosystem, as well as on local Indigenous communities. 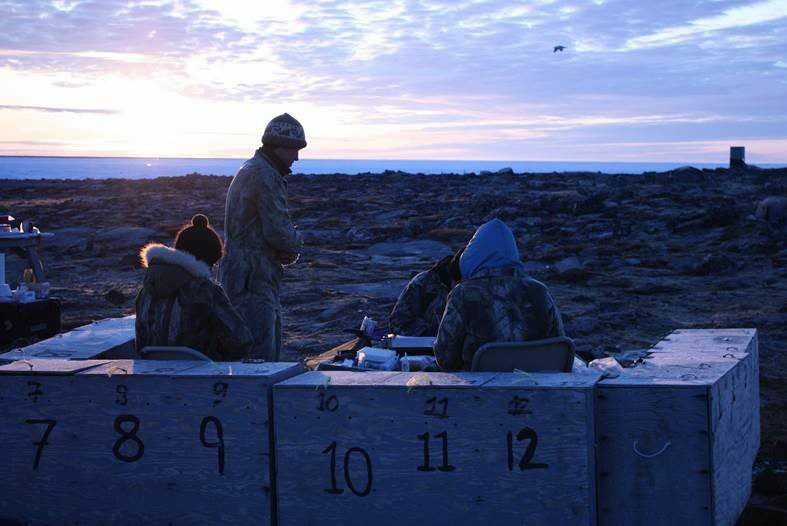 “Eiders are a very important species for Inuit in the north,” says Harms, noting some communities rely on the birds for their eggs, down and skin. A female common eider with nasal tags. 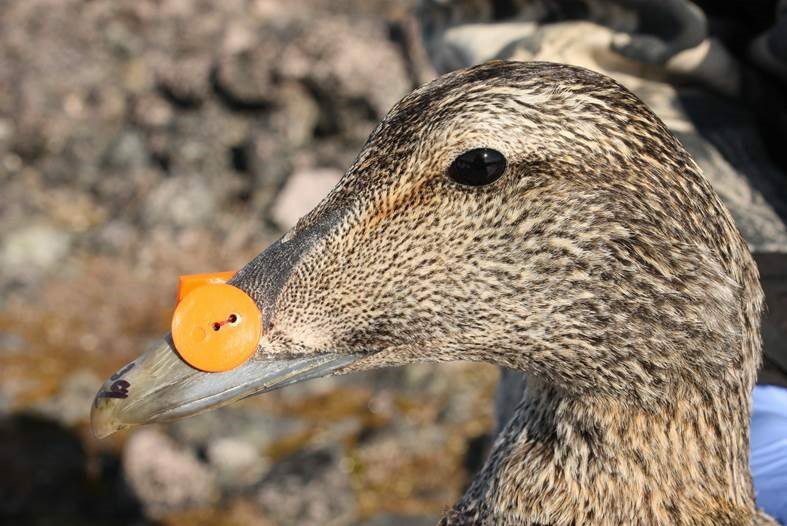 The combination of nasal tag colors and shapes allows researchers to identify individual eiders as they are monitored on their nesting areas. The tags fall out by the end of the summer. 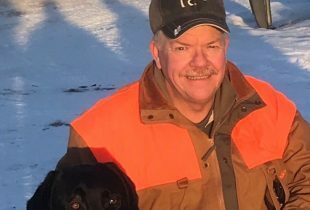 According to Dale Wrubleski, a DUC research scientist who chaired the IWWR Student Publication Award committee, Harms’ research shows that a healthy bird is better equipped to handle the stress of life events. 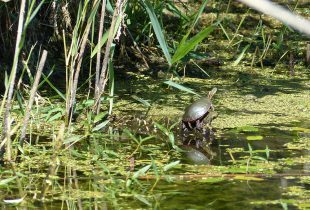 “We [DUC] don’t manage disease, but in some ways we do: by providing good habitat,” says Wrubleski. Jane Harms is one of two recipients of the 2015 IWWR Student Publication Award. This award is given to raise awareness of the IWWR student program, reward students for successfully publishing their research, and to recognize publications that make a significant contribution to waterfowl and wetland research.